Days of Diocletian once again celebrate the name of the ancient emperor who chose the most beautiful spot on the Adriatic for his palace, thus laying the foundations for the city of Split. 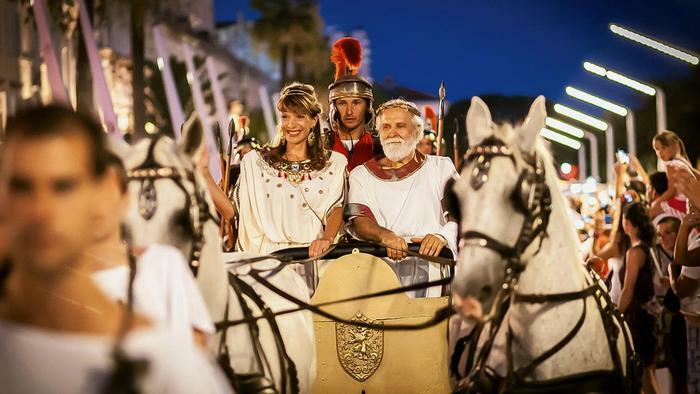 The proceedings start on August 19 with Diocletian's imperial chariot procession around the city, accompanied by his wife, the empress Prisca. The Roman-themed events continue until August 23, when the grand finale will be held. The UNESCO-protected palace will feature in the celebrations with gladiatorial fighting on the city's impressive stages. The Days of Diocletian have many musical surprises, as well as fun games whose rules were set down in Roman times. Join in the fun, toga-clad if you dare, and try the ancient specialties Split will serve up in the substructure of its breathtaking palace. Five days of legionary fun, with gladiators prowling the streets, make for an irresistable invitation to an exciting summer holiday. Don't miss the history-tinged celebrations, whose sounds will echo around the seventeen-hundred-year-old Diocletian's palace.